StoreWALL Large Tote Bag is made with heavy duty tear-resistant canvas. It is perfect for storing items for quick and secure access. These bags include mesh panels for visibility and circulation. The StoreWALL garage storage tote bag is ideal for your summer beach gear including snorkels, flipper, water pistols and everything else you take with you to the beach. Keep them all in one large bag, and when you need to go, slip it off the Universal hook and off you go. If it’s not summer beach gear then it could be your collection of Soccer balls, Rugby balls or AFL balls. These are our largest bags which provide greater height for bulky goods and equipment. The hook used to hang the Large Tote Bag are the 300mm Universal Hook. You require 2 of these. They are sold separately. 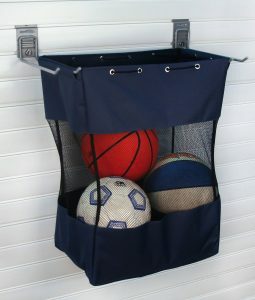 If you don’t need so much space, why not consider a smaller garage storage tote bag. Look for our Medium and Small sizes! Our Large Tote bag can handle up to a maximum 18KGs in weight capacity. Do not over pack the bag to prevent the seams from stretching or tearing.